The full form of KFC is Kentucky Fried Chicken, and it is a chain of fast food restaurants that is known for its fried chicken. The headquarters of this company is situated in Louisville, Kentucky. This is the largest chain, which serves fried chicken having 17000 outlets in almost 105 countries. It also stands second among the top restaurant chains. Harland Sanders founded this company, but he sold this company to investors. Apart from fried chicken pieces, this chain of restaurants also serves chicken burgers as well as wraps along with side dishes, which include coleslaw and French Fries. There are about 455, 000 employees working for the company. There are currently 1 consumer reviews about KFC available. Share your review. I went to KFC in Delaware *Fox Run Shopping * Newark DE one. Went thru driving thur window. Paid but was told 22 minutes I said no problem. Parked my car and went inside to wait for the 2 Chicken pot pies I ordered . While waiting saw something that upset me with one of your employees. They went outside in my view smoked and walked back inside walked right passed the sink that I could see and NEVER WASHED her hands and manager stood right there and never said on thing. The girl walked right over to the food ad never put gloves on and started filling orders. That employee know to wash her hands it is posted and I saw the sign from where I was sitting when they open the door the sink is right there. This happened on Saturday Aug 3,2013 around 5:45pm the manager was a female wearing I think a blue shirt. This manager needs to be trained on the health issues before the state comes in a watches. I hope this is brought to the attendtion of this Store and is corrected. I will not be going back to KFC. I am sure this goes on all the time but when you see it with your own eyes you tend not to go back . 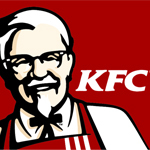 Please take a note that you are about to post a public review about KFC corporate office on CorporateOffice.com. This review will be public, so please do not post any of your personal information on this website. If you would like to contact the corporate offices of KFC, please use their contact information such as their phone number, website, and address listed above to contact them. However, sometimes staff from KFC headquarters do read the reviews on this website.